I used to love Serpico, the series and movie based on Peter Maas’s excellent 1970s crime novel, one of my favourite all time thrillers. Back in his day the tools at a cop’s disposal were relatively basic with fingerprint analysis the star of the crime investigation show, a universe away from the sophisticated electronic noses and DNA analysis we’re fed in crime investigation series’ like CSI. How accurate are TV detective dramas? Fictional portrayals of crime scene investigations often get it wrong. But it isn’t too much of an issue. After all, TV is all about entertainment: top quality storytelling doesn’t necessarily need to be 100% faithful to real life. But things get scary when pseudo-science plays a part in establishing a real person’s guilt or innocence. Take the Rorschach test, which managed to worm its way into the criminal justice system decades ago and remains a key part of psychological examinations. 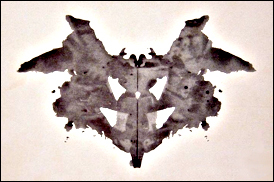 Hermann Rorschach created his famous inkblot test in 1921 in an attempt to evaluate people’s psychology. Some experts still use the test to unravel characteristics and analyse emotional functionality. It’s used to diagnose underlying disorders, decoding psychotic versus non-psychotic thinking. During the 1960s it was the most widely used test in the US, ranked number eight in the outpatient mental health facilities’ hit parade. To this day it remains the Society for Personality Assessment’s second most widely used test and, most shocking of all, is used by psychiatrists in 25% of forensic assessments. If the theory held water it’d be fair enough, but it doesn’t. It never did. It was a fascinating figment of Rorschach’s fertile and obsessive imagination, both unproven and wholly unscientific. The lie detector test or Polygraph is equally flawed, by no means a sure-fire way to establish without reasonable doubt whether or not somebody’s telling porkies. Yet in some places it remains a key element in the prosecution and defence toolbox. There are all sorts of ways to play the system and cheat, which in itself makes the test unreliable. And because Polygraph examinations are basically interrogations, stressful per se, innocent people can easily fail simply because they feel pressured and frightened. Even DNA testing, which crime dramas imply is 100% accurate 100% of the time, is unreliable unless done in enough depth and detail. Fingerprints can and do lie. And witness testimony is coming under question too, with recent research proving most of us are spectacularly bad at recalling faces after the fact. At the other end of the scale, innovative new technologies are making it easier to establish someone’s guilt or innocence beyond reasonable doubt. Take the latest DNA analysis, which identifies real physical characteristics from minute amounts of DNA evidence in an attempt to narrow down the search when a criminal’s DNA isn’t already on the national DNA database. Developed by VisiGen, a consortium of universities and law enforcement agencies, it’s the first ever test that can provide fool-proof data on gender, hair colour, eye colour and ancestry. Then there’s ‘smart guns’. A couple of weeks ago the US Attorney General Eric Holder met with the co-founder of Ireland-based TriggerSmart, the inventors of a system that means guns can only be fired by their owners. It works via a wireless transponder and tag system which also lets places like schools remotely disable guns in the vicinity. The technology identifies gun users much faster than biometric systems and is tipped to have a profound impact on gun crime in the USA. In a world where witness testimony plus circumstantial evidence is often enough to bang someone up for a long, long time, it’s vital to get it right. We only have one life. It’s short and precious. So being locked up when you’re innocent is the single biggest injustice to befall a person. It’s about time the world’s legal systems untangled themselves from old fashioned, fundamentally flawed systems of establishing guilt or innocence and hung their hats on scientifically sound methodology.